Homeowners should always be cautious when they do business with home improvement contractors. Most are legitimate, of course, but unfortunately, some don’t deliver what they promise or have unorthodox business practices. 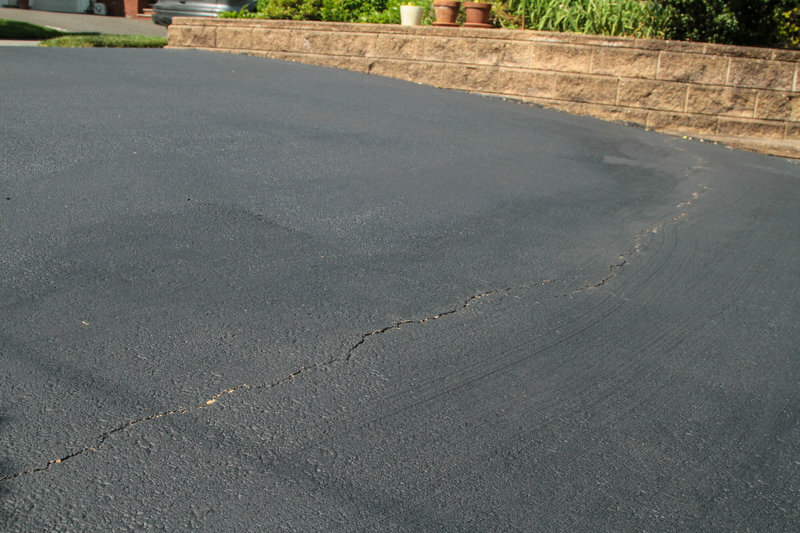 That’s why reader Matt Goldstein’s experience with a seal coating company got our attention. Still, Goldstein’s experience should remind homeowners about due diligence and not making snap decisions when it comes to any kind of contractor. You always need to do your research. 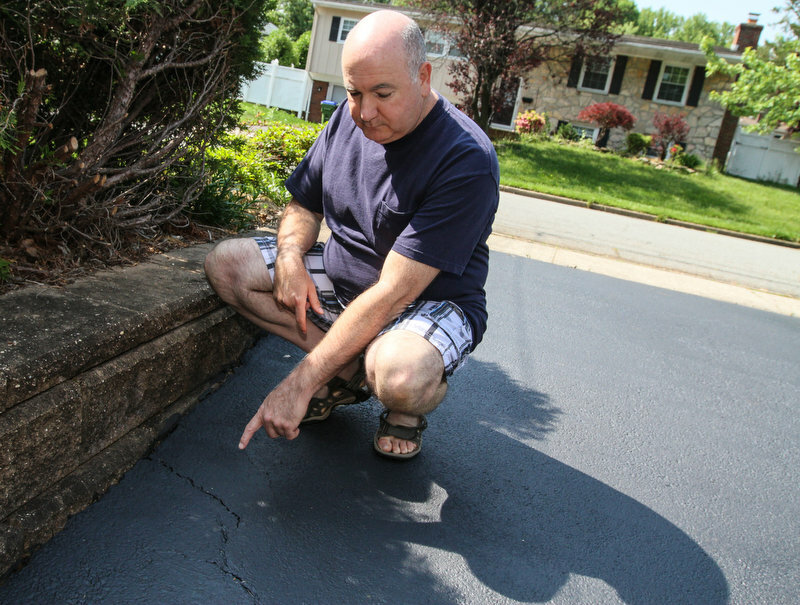 Goldstein was mowing his Edison lawn last week when a man in a pickup truck stopped to ask if he’d like his driveway sealed and the cracks filled in. “I asked how much and he said that if I agreed on the spot, he’d do it for $375,” Goldstein said. He then asked if the man, later identified as Eric Thompson, accepted credit cards, and the answer was yes, Goldstein said. Thompson also said the work was guaranteed for three years. Goldstein went back to his lawn, and before long, he took a look at Thompson’s work. When the job was completed, Thompson handed Goldstein an invoice. He noticed it wasn’t pre-printed with the company contact information and a Home Improvement Contractor’s (HIC) registration number, but was all handwritten. 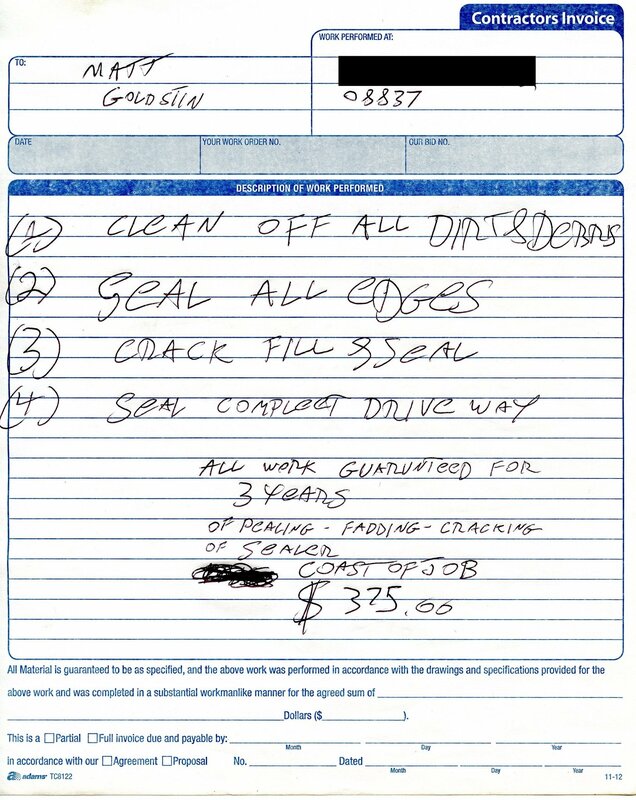 Thompson filled in the blanks with a description of the job, the three-year guarantee and the $375 price tag. He didn’t add any company information. As a side note, any invoice must by state law have the phone number for the Division of Consumer Affairs and a specific message about contacting the division in 10-point boldfaced type. The invoice didn’t have that. Goldstein said he doesn’t write checks but only sends payments through his online banking system. Goldstein said Thompson suggested Goldstein could use his credit card to purchase a Visa gift card and pay that way, or he could use PayPal. That all sounded fishy to Goldstein and he refused, instead offering to send a payment to the address on the business card, which said the business was A-Plus Roofing & Sealcoating of East Brunswick. Thompson said that would be a problem because he buys the materials from the owner — his uncle — but Thompson takes the customer payments, Goldstein said. Another side note: Business cards are considered advertising materials and must by state law contain an HIC number. This card didn’t have that. The mailing address change made Goldstein suspicious. He thought perhaps Thompson was using the company equipment and collecting payments but was not telling his boss about the jobs. Perhaps Thompson was scamming his boss, Goldstein thought. After Thompson left, Goldstein did some research, and he couldn’t find anything about A-Plus Roofing & Sealcoating. He also realized he never received information about the company’s liability insurance. Goldstein asked Bamboozled what he should do: Call the number on the business card? Pay for the work that was done? Ask for the work to be corrected? We took a look at A-Plus Roofing & Sealcoating. The East Brunswick-based company has no complaints with the Division of Consumer Affairs. The business and its owner, John Demore, don’t have Home Improvement Contractor (HIC) registrations with the state, nor is there a business or trade name filing with the state. Both are required by New Jersey. A second business, A-Plus Sealcoating & Paving/Roofing, based in Iselin, is owned by Eric Thompson. The owner and the company also don’t have HIC registrations but is registered with the state as a business. We spoke to John Demore, the man whose name was on the business card given to Goldstein. He said he’s been in business for 25 years and he’s “licensed and insured,” and he would respond about the gift card/PayPal issue after speaking to his nephew. Of the two different addresses, Demore said the one on the business card is only used to store materials. Demore asked that Goldstein call him, saying he wouldn’t have to pay for the work if he wasn’t happy with it. Goldstein made the call, and confirmed that Demore promised to look at the job and said Goldstein wouldn’t have to pay if he was unhappy. He confirmed that Thompson offered to accept payment with a Visa gift card or PayPal. “There was no foul play,” Demore said. We then asked about the two company names and the different addresses. He said it’s all the same company, and he and Thompson own the company together. We called later to ask about the HIC registrations, and Demore said he would have his attorney call, but the attorney never did. This is a good time for a refresher on what you need to know before you hire ahome improvement contractor. Make sure they’re in good standing by calling Call Consumer Affairs (973) 504-6200 or (800) 242-5846 to see if there are any complaints. Also ask if the contractor is registered or licensed with the state. Google the contractor and check the Better Business Bureau to see if there’s anything to learn. Get information about the company’s liability insurance policy and call to make sure it’s in good standing. All jobs that cost more than $500 require a written contract that includes the contractor’s legal name and business address, the job’s start and end dates, a description of the work and the total price. Even though contracts are not required for jobs costing less than $500, if a contractor provides one, it must contain the same information as any other contract. Contracts must also include the contractor’s HIC registration number and list the company’s liability insurance policy with the phone number of the carrier. The contract should also show all warranties and guarantees, and include a lien waiver that states that workers and suppliers will not ask you for money once you have paid the contractor. Consumer Affairs recommends a payment schedule where you pay one third upon the contract signing, with remaining payments based on specific milestones for the job. If any of those things don’t happen, it doesn’t mean the company or the contractor is a crook or that they’ll do a shoddy job. But it does mean they’re in violation of the law.